Let’s start off Part 2 of this blogpost with a discussion around the economy and democratic rights. You see, increasingly, people are making the connection between the economy and democracy, thanks in part to the global Occupy Movement. But even a cursory look at newspaper headlines throughout 2011 would lead anyone to conclude that there has to be some sort of connection between the two. Something very telling happened in 2011, which has been overlooked by many as a potential trend. Back in the fall, Greek President George Papandreou returned from a summit with other European Union nations (most notably France and Germany, who have been driving the attempts to get the eurozone back on track) with a plan to implement austerity measures. Rather than making the determination to simply implement those measures, Papandreou decided that he would first take the austerity plan to the Greek people, and ask for a mandate to implement austerity. That it then emerged into the realm of possibility that the Greek people would reject the austerity measures in favour of Plan B (even though there was, and still is, no Plan B) proved to be a wake-up call for France and Germany and others, who condemned Papandreou’s plebiscite as jeopardizing the entire eurozone. Papandreou was quickly made to fall into line with the technocratic powers that be, and reverse his decision on the plebiscite. He then resigned as Prime Minister. And the austerity deed was done, with no say from the Greek people. In Italy, former President Silvio Berlusconi has been replaced by the “technocratic” government of Mario Monti. Monti had been appointed to the Senate by the President just a few days ahead of assuming Prime Ministerial powers, and naming his completely unelected cabinet. We now have the absurd situation in Italy of having a government which consists completely of political appointees, rather than elected officials. That this “technocratic” government has largely been praised as the last, best hope to get Italy back on track as a healthy member of the eurozone does not and can not change the fact that democracy in Italy has taken a back-seat to the interests of the bankers. For who is really calling the shots in Europe right now? When a democratically elected Prime Minister is forced to resign after calling for a plebiscite to implement austerity measures, and when an entire country (and a G-8 country at that, with Europe's third larges economy) can be run by a completely unelected government, what is going on? And in whose interests are decisions really being made? That’s the connection between the economy and democracy. That’s not to say that a return to a healthy economy must require technocratic decision making in preference to democratic decision making (although when you watch the U.S. Congress in “action”, the flaws of democratic decision making are clearly on display for all to see). In fact, it's far from clear that the technocrats have any clear idea about getting the economy back on track at all, as they are completely plugged into an economic model which requires growth in order to remain viable. The global Occupy Movement would characterize the erosion of our democratic rights in this way: decisions are being made by the 1% for the 1%, often to the detriment of the 99%. This situation is like Tommy Douglas’ “Mouseland” on steroids, only no one elected these cats. Promises of a return to democracy are, quite frankly, a load of bull, given that the technocrats will have transformed society without having had the benefit of any mandate from the people to do so. But sure, that’s Italy and Greece. That’s not happening here in Canada. Well, that’s true, but it doesn’t have to happen here in Canada, because we have an electoral system in place in which it is very easy to allow minority interests to rule with impunity, and that’s exactly where we are at with the Harper regime at the end of 2011. Clearly, in 2011, Harper and his Conservatives, after winning a false majority government (with only 39% of the popular vote, and only a little over 20% of all electors), have embarked upon a war against our democratic processes, through acts of unilateralism. Expect this war on democracy to continue throughout 2012, and the tactics being employed (often with the use of public dollars) to promote the Harper Regime’s war will continue to smear the interests of democracy. In Canada, our national motto is, “Peace, Order and Good Government”. Arguably, the Harper Regime has been able to deliver on the first two, and that seems to make a lot of people, well, if not happy, at least content. We Canadians tend not to give a lot of thought to what good government is all about, as long as peace and order are being delivered. South of the border, though, average Americans spend quite a bit of time thinking about their own government, especially through the lens of the U.S. Constitution, a document which has achieved a very noteworthy status for most Americans. Most Americans are very proud of their Constitution, and they should be. For although it’s not a perfect document in my opinion, it seeks to create the circumstance for a way of life under the rule of law which is the envy of the world. That the United States of America has never quite achieved the potential set out in its Constitution is no matter, as it is always good to be able to have a continuing reason to strive for excellence. Increasingly, however, Americans are waking up to the fact that their beloved Constitution is under attack by their own government. That this has been going on for decades, and on many fronts, may come as a surprise to some Americans, but the acceleration of these attacks after 9/11 in the name of “security” has been particularly noticeable, and frankly should trouble Americans. In December 2011, the U.S. passed the National Defense Authorization Act for Fiscal Year 2012. Although a National Defense Authorization Act is passed just about every year by Congress, the Act for 2012 contains some rather Orwellian provisions, which supporters (including President Barack Obama) have claimed are necessary in order to continue the “war” on terrorism. Specifically, this piece of legislation will allow U.S. citizens to be detained indefinitely by their government where they are suspected of engaging in terrorist activities. No charges need first be brought, and there is no right to access a lawyer, and no remedy for appeal. Americans travelling abroad, and those in the United States, are equally at risk. This bill has raised a massive red flag for the American Civil Liberties Union, and other individuals and organizations who are concerned about the erosion of Constitutional rights. The idea of being “innocent until proven guilty” used to have an important status in the United States. Thanks to the Republican and Democratic Parties who run the government of the United States, that’s no longer the case. And given the bipartisan support for this measure, there appears to be little that average Americans can do about it. When there are only two parties to choose from, and they are both in favour of the same thing, well, is there really a choice? Of course, there are other political parties in the United States, but the U.S. electoral system heavily favours the monied interests of the existing parties. Measures such as those now found in law through the passage of the National Defense Authorization Act for Fiscal Year 2012 have prompted many Americans to ask themselves, “If the government isn’t looking out for my interests, what choices do I have?”. Some have decided that demonstrations are the answer, and the Occupy Movement emerged as the best-known example of people-power in 2011. Others are seeking to change the system from within, through efforts such as the Tea Party, however, the Tea Party since day one has proven to be nothing but an astroturf campaign to break the back of government for the interests of the corporate elite. That many involved in the Tea Party still do not understand that they are working against their own economic interests does not change this fact. And that the Republican Party has now almost been completely taken over by corporate interests masquerading as a grassroots movement again illustrates the power which massive amounts of money bring to the political equation. But there are other movements afoot which some would consider to be extreme. I expect to be hearing more about some of these other movements over the course of 2012, as trust in the government in the United States will continue to break down. Particularly, we’re going to become familiar with a couple of brands of “terrorists” which haven’t exactly been top of mind in recent years. First, we will be hearing more from groups such as Anonymous, a hacker “organization” (actually anti-organization) which was been in the news a lot throughout 2011. Anonymous has already begun pooling its resources in efforts to engage in cyber warfare on corporatist interests, particularly those which speak out in favour of rights-reducing measures. And while I don’t expect Anonymous to be branded a terror organization in 2012, I do expect that the U.S. government, and governments around the world, are going to be paying close attention to Anonymous, along with the business community. The Black Bloc will also continue to make appearances throughout 2012, much to the chagrin of the largely peaceful Occupy Movement demonstrators. The Occupy Movement itself is incredibly open to being infiltrated by those with differing agendas. While the Occupy Movement largely enjoyed public support throughout 2011, as the desire to reclaim public spaces from the occupiers became paramount, the Movement continued to lose support. Violent incidents, despite often being initiated by the police, has also led to the erosion of public support for the Movement. I fully expect public support for Occupy to continue to erode throughout 2012, even though those in the Movement have vowed a return. Occupy is at risk because it poses a direct threat to neo-liberal interests, which have been bent on reshaping the economy and democracy to be better equipped to address the interest of the corporate elites, which is, in short, the making of money. The very nature of the Occupy Movement is one of openness and transparency, and decisions are made on the basis of consensus. There are no true leaders. This leaves the Movement in an extremely vulnerable position when it comes to infiltration of other interests. In 2012, we’re going to see those other interests emerge in the form of violent anarchists intent on causing destruction to the symbols of corporate power. We’ve seen this before at G20 protests. Expect more of the same to occur with events initiated with peaceful intentions by the Occupy Movement. These demonstrations are sure to attract violent protesters. As a result, the Black Bloc may become next Al Qaeda. And, as it has been demonstrated at G20 protests around the world, when it comes to the “Black Bloc”, not everything is always as it seems. Indeed, the police use tactics of infiltration and instigation in order to break-up protests, sometimes before they can begin. In Toronto, police successfully befriended and infiltrated those planning non-violent protests at the G20 summit, and it is only now coming out that it was the police infiltrators who were championing calls for violent activity. Of course, it’s easier to arrest protesters beforehand if there’s a perceived threat of violence. Many in leadership roles at the G20 protest in Toronto were rounded up by the police before the first international leaders ever touched down in Canada. Expect to see the same happen to the Occupy Movement. In 2012, I predict that Occupy will once again become a word associated with militarism, and those engaging in the Movement will be branded anarcho-terrorists, mainly as a result of efforts already afoot to discredit what has largely been a peaceful form of civil disobedience. Efforts are already underway through the right-wing mainstream media to discredit the Movement. It is mainly due to the success that the Movement experienced at bringing the idea of income inequality to the front pages of our media (and making it front of mind in our politicians) that will ultimately doom the Movement to a tragic death in 2012. Although I sincerely hope that I'm wrong about this, as I continue to believe that the Occupy Movement remains an excellent vehicle for awakening and arousing public opinion on matters of inequality and social justice. But the corporate elites must view it as a threat, and so they will do what they can to turn public opinion against the movement. One last thing: there is emerging an alarming trend whereby governments are now discussing the need for protesters to pay for permits, police and security due to extra costs which are being generated by the protests. We may be faced with an absurd situation where protesters are forced to foot the bill for the security forces which pepper-spray them! So much for freedom of assembly! The proliferation of armed militias in the United States has largely been under-reported, especially here in Canada, which has few equivalents to this tradition. Although there are a number of militias which do operate in Canada, and which make the news every now and then; in 2011, the Quebec separatist militia, “Milice patriotique quebecois” made headlines when someone in the media discovered that it existed. Photos of gun-toting separatists posted to Facebook caused quite a stir for 5 minutes one Tuesday morning, and the militia’s founder was forced to go on a bit of a public relations building exercise to stem the hysteria. Sure, CSIS has talked to the militia, and everyone agrees that no one is breaking any law. The militia is purely defensive in nature, of course. Just like the militias in the States. But this begs the questions: in whose defense, and in defense against whom? And the only answer that makes any sense is, in the interests of the militia members and their wider community, and in defense against the Government. Many who are members of these militias take the Constitution of the United States very seriously indeed, for it is within the U.S. Constitution that the right to bear arms is articulated. Many believe that the government has been trying to slowly erode that right, along with other rights in the Constitution, by passing laws in the name of security. While militias may share the concerns of Republican politicians regarding foreign terrorists and the need to preserve the American way of life and its values, many within the militias are finding themselves at odds with Republican legislators who are openly seeking to subvert the Constitution. (Add this as yet another reason of why the “left vs. right” political dichotomy has truly broken down). Truly, these armed militias are going to pose a bit of a problem for a government which wants to eliminate rights and freedoms. They’ve been flying under the radar for some time now, and that’s largely because the militias themselves aren’t particularly keen to draw a lot of attention to themselves, and because the government doesn’t really know what to do with them. Since they haven’t been causing much trouble lately, well, it’s been best to pursue a policy of live and let live. However, in 2012, with the economy expected to increasingly break down in the United States, and personal freedoms and liberties continuing to be under attack by legislators, including every Republican contender for the GOP nomination except for Ron Paul, we can expect some of these militias to become more active (or at least elements of these militias). It would not be beyond the realm of possibility that we may see a number of Oklahoma City-style bombings or other violent actions from truly fringe elements within these militias (or worse, a false flag operation by the government itself, in order to bolster President Obama’s re-election bid, just in case that war with Iran thing falls through). Also look for the stirrings of successionist movements at the State level in the U.S., particularly in Texas, California and the other western sates. You can see how the passage of the National Defense Authorization Act for Fiscal Year 2012 might come in handy for a government keen on incarcerating Americans expected of involvement in terrorism. If the Black Bloc becomes Al Qaeda in U.S. cities, operating within the Occupy Movement, well, it will be that much easier for the government to round up and detain the organizers behind the leadersless Movement when things start to turn violent. The same can be said for the militias and for Anonymous. We will start to see the tip of the iceberg regarding “domestic terrorism” in 2012, as increasingly, those involved in peaceful and lawful demonstrations and organizations will become “terrorists” by virtue of professing anti-government stances. The real scary stuff, however, probably won’t happen for a few more years yet. But by the end of 2012, the plan to incarcerate citizens who hold anti-government views should become a lot more obvious, and even the mainstream media will start to cover the trend. And if you think that Canada will be immune from this sort of lunacy, think again. We in Canada have never enjoyed the range of Constitutional protection from the state in the same way that Americans have, so our laws haven’t required the sorts of drastic overhauling that we’ve seen in the U.S. Here in Canada, we’ve already witnessed the massive detention of peaceful protesters on suspicion that they might become engaged in violent activity, through the kettling efforts of police at the G20 in Toronto. Still approximately 1000 others were arrested, some of whom were the victims of police violence; some for engaging in civil disobedience, or simply for being in a public place at the wrong time. In Canada, there’s always been a much finer line for rights. With the Harper Crime Bill sure to be adopted in 2012, and with super jails being built across Canada, we can certainly expect an uptick on the number of criminals, many of whom will be doing nothing different tomorrow than what they’ve been doing today, and some of whom are sure to be pro-democracy protesters. Many pundits are claiming that 2012 isn’t going to be the year of the global economic collapse, while the average citizen (who isn’t an economist), almost certainly expects it to be. I smile when I hear the pundits talk about the economy’s health and recovery, because I know that economists have to talk this way in order to create the idea of confidence in our economy. That this kind of talk is often successful in achieving the desired outcome, and thus becomes a self-fulfilling prophecy, does not bother me In fact, I’d very much like the economy to remain healthy. I was born into a world with the understanding that economic growth is good for everyone, including me. I sincerely enjoyed believing in this reality, because it seemed so very real. But I know that economic growth can not be sustained, due to the depletion of non-renewable energy resources. Trust me, I’d rather stick my head in the sand and pretend that the sky isn’t falling, and go on about my merry way. But I can’t, and increasingly, neither can more and more citizens whose eyes are being opened. However, I don’t think that we’re in for global economic collapse in 2012. I expect that the economy will slip back into recession, even here in Canada, but it will prove to be an incremental recession, and recovery will be predicted on the horizon. Only it won’t be on the horizon, and 2013 is going to prove to be a very bad year. Author and futurist James Howard Kuntsler described this time as being the early stages of what he dubbed “The Long Emergency”, and I’ve come to think of the unfolding decade in this way. The Emergency isn’t going to get underway all at once, but as we’ve already found ourselves in the downward spirals leading to the Emergency, we’re not going to be able to climb out of it any time soon. So, it’s best to prepare for the future which we will find ourselves in, rather than yearning to return to a past which can no longer be. That we must change our governmental, economic and social institutions in order to meet the challenges of the Long Emergency is an evident truth. That there will be considerable resistance by the vested interests of the corporate elites to do so is also self-evident. 2012 will prove to be Year 2 of the struggle between the forces of the neo-liberal corporate elites and Everybody Else. Already, the notions of “left wing” and “right wing” on some sort of linear political spectrum have already started to break down. Increasingly, throughout 2012, pundits and the media will begin to move away from the “left vs. right” political narrative. And I think that’s going to happen in the United States too. If you don’t believe that left/right political narrative has started to break down, note the use of the terms “fascism” and “communism” to both describe the actions and policies of President Barack Obama by Republicans. Traditionally, we have placed the ideology of fascism on the far right of the political spectrum (and indeed, the Republican Party itself has certainly been attacked lately by pundits on the left, and also particularly by libertarians, as being “fascist”), while communists inhabited the far left end of the spectrum. When an understanding of concepts begins to break down, using those concepts as descriptors becomes increasingly irrelevant. If no one understands what you’re talking about, you can talk about anything, but it's not helpful. But it’s more than that. The rise of libertarianism in its post 9/11 form on the one hand, and the rise of green politics have also challenged the left/right political dichotomy. For although pundits often place libertarians on the right side of the political spectrum, libertarians themselves are increasingly less likely to identify with the Republican or Conservative parties in the U.S. and Canada, due to those Party's continued support of big government and their desire to restrict personal freedoms and rights. 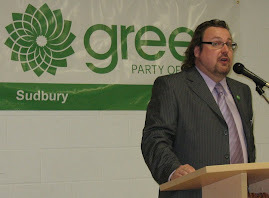 Equally, pundits have been comfortable placing greens on the left of the spectrum, I think largely because there isn’t a very good understanding of green politics out there, but also because environmentalism is seen as requiring strong government regulation in order to work, and that’s generally been considered as the purview of social democratic parties (although it has been Conservatives in Canada and Republicans in the U.S. which have created the biggest deficits, so it's not at all clear which parties are truly the parties of "big government"). But this political narrative has started to break down, which means that a new narrative must emerge, in order to edify the pundits and the public. I believe that we’ll find ourselves in a bit of a transitionary phase for the next few years, although a good counter to the existing left/right narrative has already emerged, at least in one form: the “1%” vs. the “99%”. The problem with the 1% vs. the 99% as a political concept is that many have a hard time identifying with others in the mix on the 99% side of things. That being said, though, not everyone ever fully understood just where on the political spectrum they stood, which gave rise to terms such as “red tory” and “blue liberal”, and populist political parties like the Reform Party. Nevertheless, I believe that the political narrative will begin to turn into one where the story is no longer “left” vs. “right” but “neo-liberal” vs. “Everyone Else”. That this narrative will prove to be cumbersome and somewhat unhelpful down the road is why I believe that it will be transitory. However, when you are reading political stories in the media in 2012, keep this changing lens in mind. There are some very scary pictures in your Cristal Ball Steve, however upon glancing into my own I see many of the same scenes play out. Eat a Banana, Save the Planet!